A narcissist is more than just vain. Narcissists have a compelling need for admiration and a lack of empathy for others. They have a grandiose sense of self-importance and consider themselves their number one priority. They exaggerate their accomplishments, seek excessive admiration and consider themselves better and more important than other people. You may know someone who is a narcissist. You may even be in a relationship with one. Narcissists are pro’s at manipulation, so it can take time to see them for who they really are. Their sense of entitlement and lack of empathy for others bring about an arrogant attitude, but they can hide their true self when they want to. Their master manipulation skills allow them to deceive others, shift blame and constantly play the victim card. Narcissists will never admit that they are wrong. They will become defensive in any situation and turn the blame on whoever they can. They’ll interrogate you, bring up any possible faults and make you question whether it really is your fault. When you try to defend yourself, the narcissist will twist your words and tell you that you never take accountability for your actions. 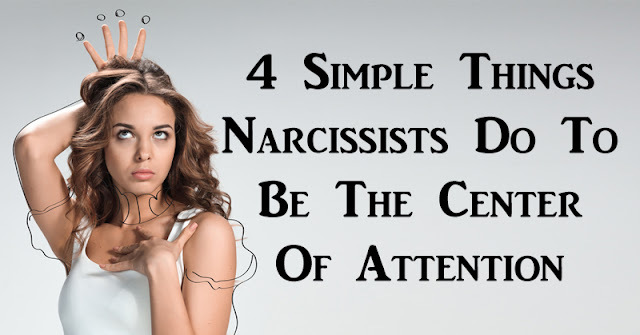 A narcissist wants to be the center of attention at all times. If the topic doesn’t involve them, they’ll interrupt and attempt to refocus the conversation back to them. They have no interest in listening to someone else, because they truly don’t care about other people. Narcissists constantly want to dominate the conversation. They feel compelled to talk about themselves in front of others and exaggerate their accomplishment. If another person in the conversation won’t cooperate, the narcissist immediately perceives them as threat to be dealt with. A narcissist uses intimidation to manipulate you into feeling the way they want you to feel. Their goal is confuse or intimidate their victim into agreeing or giving in. As a narcissists bullies you into submission, you may let down your defenses and finally give in. When you finally give up or admit that they’re right, they’ve succeeded. Narcissists are extremely competitive. They treat everything as a win or lose situation, and they don’t like to lose. A narcissist is a master manipulator, but they’ll never let you see that. Instead they’ll constantly play the victim in every situation. A narcissist can often be hard to spot because they know how to be likable and charming. But they seek pity from anyone and everyone who will listen. They see empathy as a powerful tool they can use to take advantage of other people and get what they want. When they eventually hurt someone, they’ll play the victim once again and use manipulation to blame others.